Shares in Samsung fell further on Wednesday after the smartphone maker said it would scrap production of its flagship Note 7 model. Shares fell 3% at the open, adding to Tuesday's 8% fall. The company has seen more than $20bn wiped off its market value in two days. 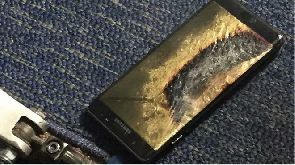 The Note 7 was recalled over exploding batteries in September but as new phones showed the same problems, the South Korean firm has now scrapped the device entirely. The drop in shares marks a one-month low for Samsung as concerns grew that the current crisis will go beyond the costs of the recall and affect the brand's overall reputation. Analysts are suggesting the Note 7 crisis could cost Samsung in the long run, particularly coming just as rivals, including Google and Apple, have announced new high-end smartphones. The Note 7 had been seen as the main rival to Apple's new iPhone 7 model. Samsung's woes have sent Apple's shares to a 10-month high. In September, Samsung recalled around 2.5 million phones after complaints of exploding batteries. It later insisted that all replaced devices were safe. However, that was followed by reports that those phones were catching fire too. But on Tuesday, the company said it would permanently cease production of the device and urged owners to turn it off.